Here are a select few of the best resources we have found elsewhere online that we think you will find useful. Addition suggestions are welcome. Official website by the Government of the Balearic Islands. Consell de Mallorca's official Mallorca map in JPG-format. 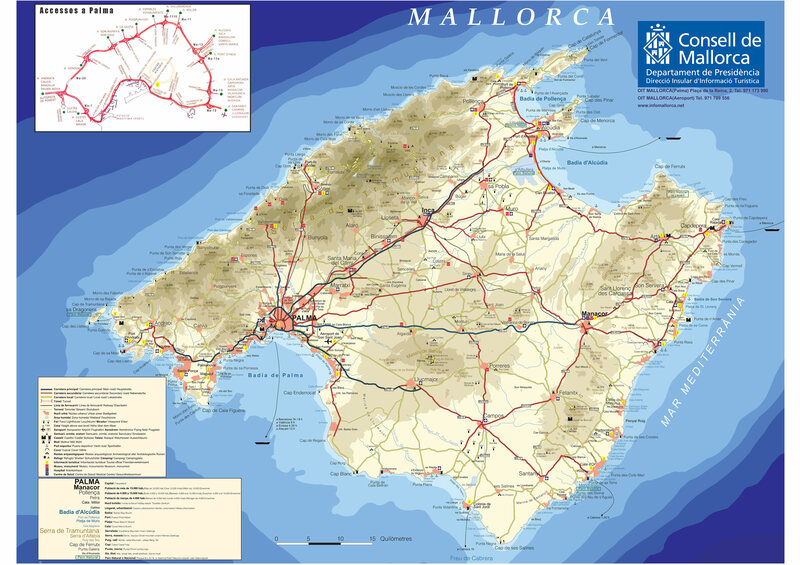 You can get a printed copy of this map from the tourist information offices in Palma de Mallorca. The printed versions have a map of Palma on the other side. This is the official beach guide by the Balearic government and although it is still in beta-phase, it already provides many photos and extensive information on numerous beaches. It also includes a feature no other beach guide is able to provide - reports on beach swimming conditions and conditions history based on information provided by lifeguards. Coming soon! Interactive map of Mallorca with markers for all the main sights, resorts, beaches and other places of interest is being updated. The new and improved version will be online shortly.